Saying the road ahead was "very difficult," Tesla's CEO Elon Musk said Friday that the company would be cutting its staff by about 7 percent. Scott McGrew reports. Tesla will cut 7 percent of its workforce as it tries to lower prices and break out of the niche-car market to produce an electric vehicle that more people can afford. "Looking ahead at our mission of accelerating the advent of sustainable transport and energy, which is important for all life on Earth, we face an extremely difficult challenge: making our cars, batteries and solar products cost-competitive with fossil fuels," CEO Elon Musk said in a letter to staff. "While we have made great progress, our products are still too expensive for most people." Tesla had boosted its payroll significantly to meet production goals, but then cut its staff by 9 percent in June. The company delivered more than 245,000 electric cars and SUVs last year, nearly as many as all previous years combined. But it still fell far short of a goal set nearly three years ago of manufacturing 500,000 vehicles for the year. Musk said in October that Tesla Inc., based in Palo Alto, California, had 45,000 employees. The 7 percent cut would mean that about 3,150 people will lose their jobs. Tesla posted a $311 million quarterly profit in October, only its third profitable quarter in eight years as a public company. Musk said the profit was its most meaningful since the creation of the Tesla, but acknowledged that it was achieved only because it was able to sell higher priced vehicles in North America. And while preliminary numbers indicate another profitable quarter ahead, Musk said it appears to be a smaller. Shares slide 7 percent Friday. 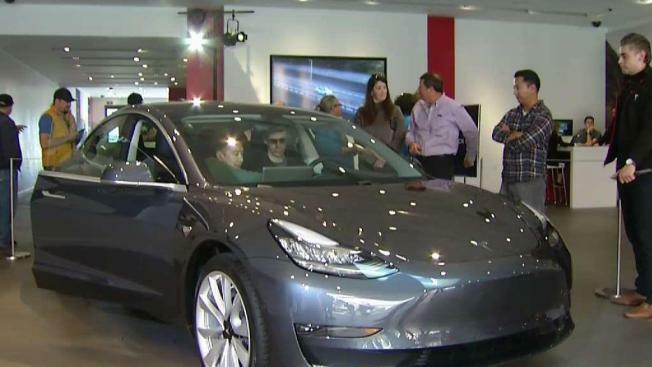 It has been Tesla's long-held goal to get a less-expensive, mid-range Tesla Model 3 on the road. The key for Tesla is producing an entry-level car in the mid-$30,000 range, which would put it in direct competition with major automakers. Even as Tesla struggles to produce a more mainstream vehicle, many industry analysts still see the company as the one to beat, even with the world's biggest automakers now fully engaged in the pursuit of an electric car. The U.S. had put into place a $7,500 tax incentive for people to buy electric cars, but President Donald Trump and other Republicans consider the credit a waste of taxpayer money and want it eliminated. That incentive was reduced to $3,750 this month and it will be cut to nothing by the end of the year. To counter the fading tax incentive, Tesla this month cut the price on each of its three models by $2,000.